I love this season when farmers’ markets and produce stands are filled with sweet, ripe fruits and vegetables. I usually buy more than I need because I am so happy to have access to such prime produce. 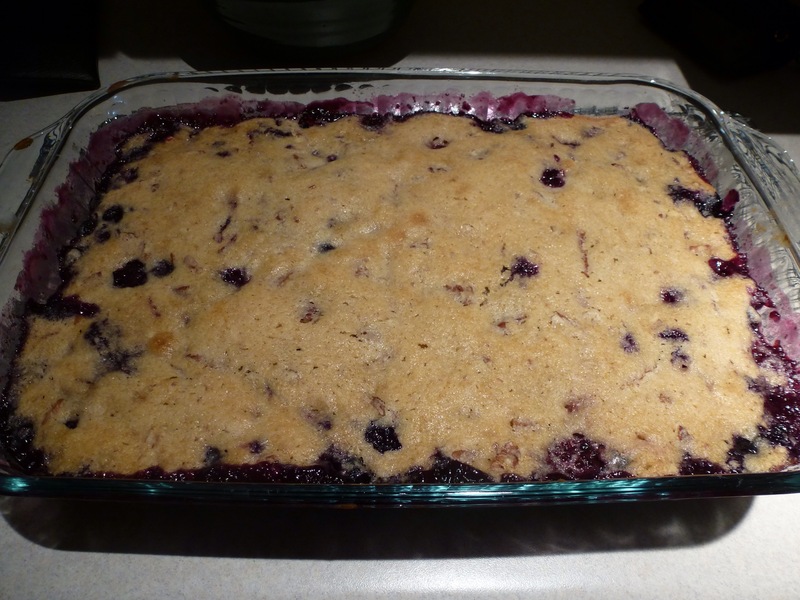 This weekend I bought sweet blackberries and made this cobbler. I often make cobbler with a biscuit topping, but I love this cake topping studded with pecans. It pairs so well with the berries. You can eat it plain or top it with cream or ice cream. Preheat oven to 350 degrees. Grease a 9×12 pan. In a large bowl combine the filling ingredients. Stir gently to incorporate, then pour into prepared pan. Make the cake topping by combining the dry ingredients and spices in a large bowl. Mix. Add wet ingredients and stir to mix well. If the batter seems a bit too thick, add a little extra milk. Stir in nuts. Spoon cake batter over fruit and spread to the edges of the pan using a spatula. Bake for 30 minutes, rotating the pan halfway through baking. The cake should be light golden and the fruit should be bubbling. Place on rack. Serve warm or cold. Serves 8-10. This entry was posted in Cakes, Desserts, Fruit, Thanksgiving. Bookmark the permalink. It’s a good recipe and you can vary the fruit with whatever you have on hand, peaches and raspberries, blueberries and peaches, pears and berries. Enjoy.